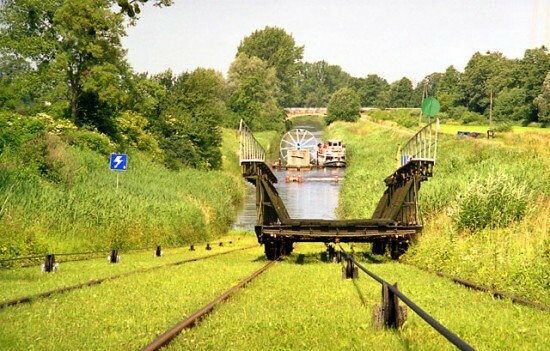 The 82 km long Elbląg Canal, due to the hydro-technical devices operating there since 1860, is unique in the scale of the whole world. 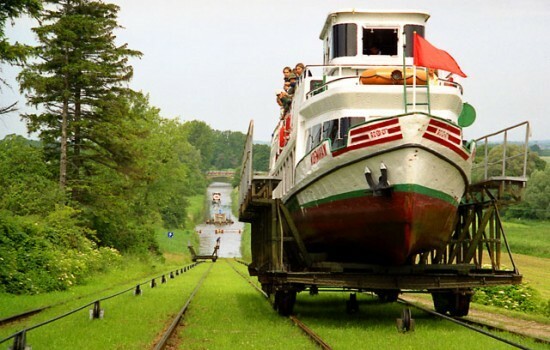 The level difference on a stretch of 9.6 km of the canal is over 100 m, and this is travelled by the ship with use of five ramps (where a cart moves the ship over land on rails, driven by the force of flowing water). This world’s unique monument of art of hydro-technology, designed by Jakob Georg Steenke, a Dutch engineer, in the early 1800s in the courts of Frederic I and II to form a watercourse economic connection between the East Prussia (German “Oberland”) with the Baltic Sea waited 20 years (1825-1844) before the works started. The construction itself took only 8 years. Starting with 1852 regular connection between Iława and Elbląg was kept by the steamer of Iława based “Reederei Kardinal” ship company, later on to be supplemented by the “Reederei Matzmor” company (screw steamships “Martha” and “Ernst”). The Zalewo based shipowner by the name of Munter also had a ship named “Ursula”. The Miłomłyn – Ostróda section was only opened officially in 1860, although the first ship from Elbląg travelled the canal to Ostróda as early as in 1856. The last stretch of the system of canals from Ostróda to Stare Jabłonki, through the Pauzeńskie Lake was opened as late as 1873. The opening, in 1872 of the competing railway line that coincided with the opening of the channel, lessened the economic significance of the canal, still up to 1912 it was used exclusively to transport crops, wood and industrial products. Apart from timber floating operations the transport was achieved with use of barges made by the Elbląg based “Schichau-Werft” shipyard and the ships of the Ostróda Office for Water Constructions (German “Wasserbauamt”): steamers “Steenke”, “Röthloff” and the motor towboat “Osterode”. These vessels were operated by the future shipowner (born in 1888 in Siemiany) Adolf Tetzlaff. His ship company “Schiffs – Reederei Adolf Tetzlaff” offered not just commercial cargo transport, but also started tourist cruises, with use of the “Rose of the Lakes” (German “Seerose”) motor boat. Till 1927 the tourist fleet of Tetzlaff also included the “Herta” (1914) ship and the “Heini” (1925) cruise ship. After 1927 regular tourist cruises between Ostróda and Elbląg were serviced by the “Konrad”, built in Elbląg shipyard. In 1930s the cruises were organized by the Office of Tourist Services (German “Verkehrsbüro”) in Ostróda. In Elbląg the tourist cruises were offered by two companies of Wenzel and Harwardt and an association from Königsberg under the name of “Landesverkehrverband Ost-u. Westpreussen e. V”. The company of A. Tetzlaff operated till late 1944. The military operations of 1945 caused substantial damage to technical devices of the canal. On initiative of Zygmunt Mianowicz, and with aid of A. Tetzlaf the canal was made passable again in 1948 and Żegluga Gdańska reopened the regular tourist cruises. In the years 2013-2014 the Canal together with ramps and locks were subject to general overhaul, and among others the canal bed was desluged, the banks reinforced and the antique technical details restored. The unique natural and landscape features of the Canal and its vicinity are visited by thousands of tourists – both passengers of the cruise fleet, and individual sailors – each year. Even with those huge number of visitors the human interference in the natural environment does not threaten the co-existence of hundreds of species of plants and animals, thanks to the presence of natural reservations, landscape parks and the protected landscape areas, as mentioned before. Discovery of the abundance of nature and aesthetic values is possible in particular during the calm cruises on the canal, hikes and bicycle tours, made easier with the ever denser network of tourist trails.